The first half of 2010 was a period of research via the Internet and books about the state of the art for amateur astrophotography leading to a resolve to begin again a hobby I had left over 25 years before with good quality but entry level DSLR camera and a computer controlled telescope. This resolve came to fruition in August-September 2010 with the purchase of initial telescope and astrophotography gear and the remainder or 2010 was spent using and understanding it and the 'light gathering' and 'image processing' processes. The photos in this gallery, established a year later in late in 2011, contain in-camera JPEG photographs from the first couple of months and then initial efforts at image stacking and the use of RAW images WITH ABERRATIONS FOR ALL TO SEE. They also show quite a deal of impatience as initially I was curious to see what was within the light grasp of an 80mm telescope in metropolitan light polluted skies (the suburb of Willetton, 12Km south of Perth centre, Western Australia). Showing these is quite intentional as it was a learning period for me and whilst I’d read about such things as light pollution filters, focusing masks, ‘darks’, ‘flats’ and ‘bias’ frames, Digital RAW images and post processing to ‘stack’ all these things, the reality of taking photographs and seeing the output helped greatly in understanding the image processing requirement. I reprocessed my initial images several times over the first 6 months as I learned and as I have loaded these to this gallery have re-processed some to show side-by-side to show that the learning process continues yet! 1. Acquite a good small true-APO triplet Refractor with good quality focuser, for astrophotography without need for filters, on a solid mid-range and portable Equatorial GoTo tracking mount, short duration unguided colour photos with APS-C sensor size DSLR (Second hand to keep costs down). Possible option of Illuminated reticule finder for longer duration photos. 3. Acquire larger OTA (8-11”) for astrophotography with full 35mm sensor or CCD capability and move Refractor to guide scope with added auto guider. a) Winter specials reduced mount costs to the point that it wasn’t much more expensive to buy the “step 2” mount. b) The idea of short duration of unguided shots creates a lot more work in both image acquisition and post processing time. Auto guiders are now less than $400 and make a modest mount a very stable and usable piece of equipment. c) A Field flattener is essential to maximize the usefulness of your APO Refractor images, even for a modest APS-C sized image sensor. d) Imaging in a metropolitan area without a light pollution filter … what was I thinking! e) Lots of little extras like cases for transport, QUALITY cables & cable management, dew control (yes, even in Perth) and transportable power supply. - A second hand Digital SLR camera with good astrophotgraphy support: Canon 400D - 10.1MP, ISO 100-1600, shutter 1/4000-30+Bulb,Sensor 22.2x14.8mm,Pixel 5.7uM, no Live View, no video. - A second hand 80mm Apochromatic (triplet) refractor for imaging: Apogee OrthoStar LOMO 80/480 f/6.0. Combined with Canon 400D DSLR gives 106' x 159' field. - Planetarium software Stellarium, Cartes du Ciel and Starry Night Orion special edtion. Telescope control software EQMOD and Ascom platforn. Guiding software Stark PHD. Image Acquistion software Canon EOS Utility. Image stacking software DeepSky Stacker and image processing software GIMP and Adobe Photoshop CS5 trial. All image acqusition software installed to an existing Toshiba Satellite T130 laptop and image processing software to an existing more powerful desktop. - The plan varied in 2012. Refer to 2012 gallery for details. Third in a sequence of four 'stacks' at differing exposures to gauge the impact on the outcome. First test 'stacked' and guided image of this impressive object. 5 images stacked using DeepSkyStacker 3.3.2 and cropped and colour adjusted by Adobe Photoshop CS5. 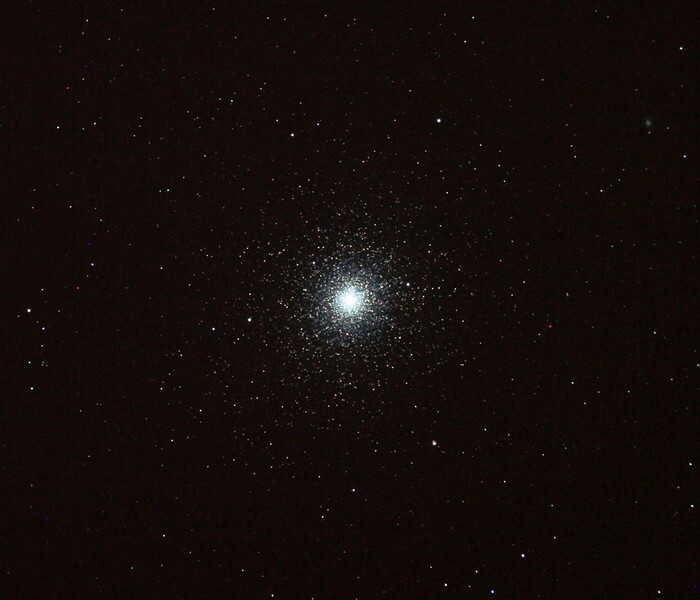 Taken through the Apogee 80 on the SkyWatcher NEQ6 mount. Guided for 120sec @ISO 400 in-camera JPEG with no in-camera dark, no field flattener but with a light pollution filter. Things to note in this sequence of 4 images (this is the third) is the increased extent of the cluster as the exposure time increased from 30 to 60 to 120 to 180 seconds. The central area becomes over exposed however with the longer durations. Likewise the number of obvious hot pixels increases with exposure and without the use of 'dark frames' to try to combat these. This was my first experience with the high dynamic range of some objects and the challenges of getting good processed images from them. Also notice the field rotation caused by polar mis-alignment. Cropping has avoided the spherical aberration from the outer edges of the original image. Focused using a Bahtinov Mask. Telescope - Apogee OrthoStar LOMO 80/480 without Field Flattener, Hutech LPS-P2 light polution filter, Canon 400D DSLR, Ambient xxC not noted. Mount - Skywatcher NEQ6 Pro. Guidescope - Orion ShortTube 80 with Star Shoot Auto Guider.